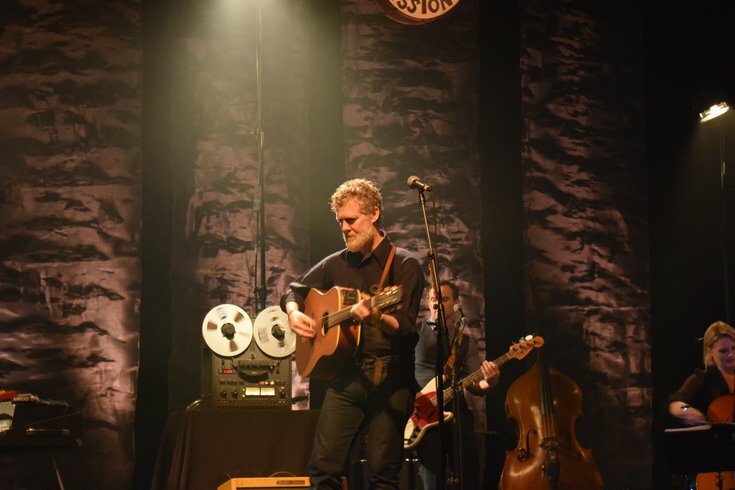 Glen Hansard entertained the crowd with an evening of songs and stories. Hansard played “Paying My Way.” It's about working hard to support a family, then taking solace in the pub afterward. Then the rollicking “Lowly Deserter,” a song about the down-on-their-luck fellows Hansard’s father brought home for temporary shelter (or “the druncles,” as the Hansard family called them). Other songs and stories were about a friend who deserved a kick in the pants, “My Little Ruin,” and a friend who deserved a heartfelt apology, “McCormack’s Wall.” He also played songs from “Once,” but there were no anecdotes about those; he lets his Oscar and Tony awards speak to that. After a stunning set that included an interlude into “Pure Imagination” with virtuosic accompaniment from his mini string section, Hansard played a strip down encore on acoustic guitar. Afterward, he invited a young fan to join him onstage to sing along to “Gold” and a busker named Ryan that he saw performing outside the venue earlier. They ended the night unplugged. Opening performer Joe Purdy joined Hansard, the young fan, and the band members for an acoustic version of Leonard Cohen’s “Passing Through.” And everyone got to go home with a story of their own.